Relying on intelligence alone to pull things off at the last minute may work for a while, but, generally speaking, at the graduate level or higher it doesn’t. The devil is often in the details; if you think you understand a piece of mathematics, you should be able to back that up by having read all the relevant literature and having written down at least a sketch of how that piece of mathematics goes, and then ultimately writing up a complete and detailed treatment of the topic. (See also “learn and relearn your field“.) It would be very pleasant if one could just dream up the grand ideas and let some “lesser mortals” fill in the details, but, trust me, it doesn’t work like that at all in mathematics; past experience has shown that it is only worth paying one’s time and attention to papers in which a substantial amount of detail and other supporting evidence (or at least a “proof-of-concept”) has already been carefully gathered to support one’s “grand idea”. If the originator of the idea is unwilling to do this, chances are that no-one else will do so either. In short, there is no royal road to mathematics; to get to the “post-rigorous” stage in which your intuition matches well with what one can establish rigorously, one has to first invest real effort in learning and relearning the field, learning the strengths and weaknesses of tools, learning what else is going on in mathematics, learning how to solve problems rigorously, and answering lots of dumb questions, and so forth. This all requires hard work. Of course, to work hard, it really helps if you enjoy your work. It is also important to direct your effort in a fruitful direction rather than a fruitless one; in particular, spend some time thinking ahead, and don’t obsess on a single “big problem” or “big theory”. There will of course be times when one is too frustrated, fatigued, or otherwise not motivated to work on one’s current project. This is perfectly normal, and trying to force oneself to keep at that project can become counterproductive after a while. I find that it helps to have a number of smaller projects (or perhaps some non-mathematical errands) to have at hand when I am unwilling for whatever reason to work on my major projects; conversely, if I get bored with these smaller tasks, I can often convince myself to then tackle one of my bigger ones. See also my thoughts on time management. There are also times when one realises that a project is simply too much to handle at the present time, and it then makes sense to modify one’s goals for the project, or shelve it and work on another project instead: see “be flexible” and “use the wastebasket“. One final note: there is an important distinction between “working hard” and “maximising the number of hours during which one works”. In particular, forcing oneself to work even when one is tired, unmotivated, unprepared, or distracted with other tasks can end up being counterproductive to one’s long-term work productivity, and there is a saturation point beyond which pushing oneself to work even longer will actually reduce the total amount of work you get done in the long run (due to the additional fatigue, loss of motivation, or increasingly urgent need to attend to non-work tasks that this can cause). Generally speaking, it is better to try to arrange a few hours of high-quality working time, when one is motivated, energetic, prepared, and free from distraction, than to try to cram into one’s schedule a large number of hours of low-quality working time when one or more of the above four factors are not present. 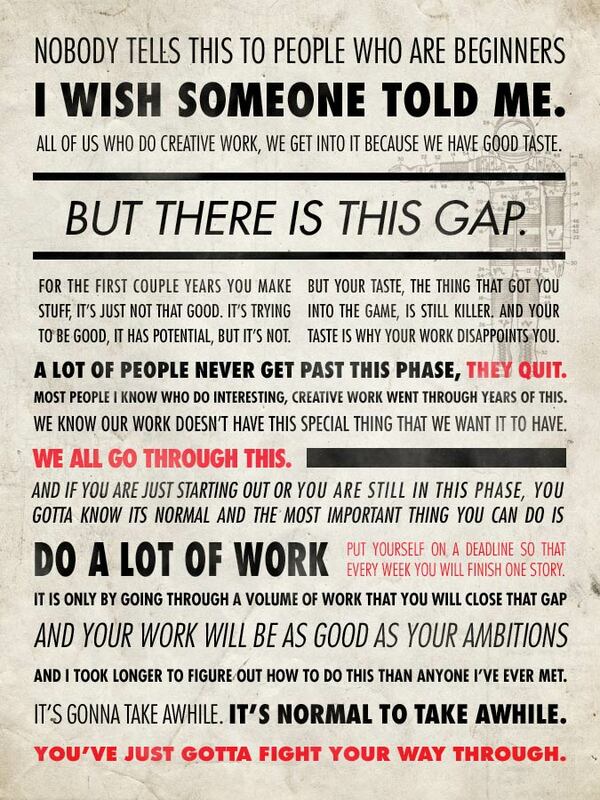 See also this quote of Ira Glass on the hard work needed to bridge the gap between low-quality and high-quality creative output. Thank you so much for your career advice page. I remember reading a comment some time ago from a person asking you about advice for time management. It seems to me also that you have an unlimited supply of energy in writing papers, books, teaching, maintaining your blog, giving talks, etc. etc., on top of your personal life. How do you do it??? As regarding learning different areas of mathematics, this is pretty much a continuous process; the need to keep on learning doesn’t stop once one exits graduate school. But it gets easier with time, because you start seeing more analogies and connections with the mathematics you already know, and also you get a sense of what parts of a theory are the key ones to focus on, and which ones are the routine computations which one can skim over; you start “seeing the plot”, so to speak. Also, the compounding power of experience is quite remarkable; if every year you manage to expand your mathematical horizons by (say) 10%, then by ten years or by thirty, you can handle a range of mathematics which may seem quite amazing to a less experienced mathematician. I apologize for the following longish comment, but I find that while “Work Hard” is, prima facie, good advice, it is also too simplistic to be helpful. When I was in graduate school, my advisor told me the same thing: Work hard, it is the only way to get anywhere. It would have been good advice, except at first, I didn’t know what I should spend my time on: Should I spend most of my time sitting around thinking about a problem and hope I would find a solution eventually, or should I mainly read papers, and if so, how should I read papers, in what detail, etc.? Since I didn’t like reading papers, I mostly sat around hoping to come up with an idea that would solve my thesis problem. Needless to say, it didn’t work very well. It would have gone all wrong if it wasn’t that I eventually realized that there is a parallel between elite sports and mathematics, and that I could use my experience as a tennis player as a template for how to become a working mathematician. My other great passion in life is tennis. But if you want to become a good tennis player it is not enough to go out and play a lot of matches. You have to spend time “off the court” in the gym and on the running track to get strength and endurance. You have to do lots of drills working with a coach to perfect your strokes and technique. And you have to relentlessly work on your weaknesses. The world is filled with people who work hard but have little or nothing to show for it. The issues become: (0) what are the goals of the work; (1) work smart; (2) Have a mixed portfolio of work in progress; (3) have a mixed portfolio of collaborators; (4) Work long enough; (5) assess whether the work is taking you towards the goals; (6) return to (0), lather, rinse, repeat. I presume that, simultaneously, the implementation of these rules vary considerably from one person to another; and that there are general laws that apply to the process integrated over all people. (1) work smart. Experts such as Terry Tao and John Baez give exceedingly good advice on what this means, online. (2) Have a mixed portfolio of work in progress. Parameters vary from person to person, but the endpoints of the distribution include at the low end: work only on problems easy enough that you can almost always solve the problems encountered; and at the high end: work on one huge problem which might take you years, your whole life, or never be completed, but which, if solved, make you rich and famous, with Clay Institute megabuck or another Hilbert problem resolved, or Fields medal in hand, and a profile in The New Yorker. What is your perception of the distribution? For Game Theoretic reasons, I suggest a mixed strategy. I do not deprecate the low end: many of my 1,994 contributions in the OEIS are aimed at what for me is one sweet spot: problems which are original, elementary, nontrivial, and good to teach even high school students. 174 of my other OEIS entries link to arXiv papers in pure Math, mathematical Biology, or Mathematical Physics, because the best way to read Math (in my humble opinion) is to read actively, with pen in hand, or multiple windows open on your computer’s desktop. Commenting on the work of others, with complete credit given, is collegial, and perhaps useful. (3) have a mixed portfolio of collaborators. In school, and at home, and in social groups, we learn how to do collaborative work. In university, we have a chance beyond study groups, namely in working with one or more mentor professors. There is a network effect, where successful collaboration links you into the community of Mathematicians, and leads to more collaborators. Erdos number, and all that. (4) Work long enough. That’s estimated on another thread of this blog. My rule of thumb is that it takes 10,000 hours of serious work to become proficient at any adult activity. Your mileage may vary. (5) assess whether the work is taking you towards the goals. Develop a model of the part of the Ideocosm (Zwicky’s name for the space of all possible ideas) where you are working. Learn its topology. Is it a metric space? If so, what is the distance between where you are and where you goal may be? Or is it only a semimetric space (i.e. is there a triangle inequality on distance between points in your part of the ideocosm)? Assessment, with the help of collaborators, and self-assessment seems essential. (6) return to (0), lather, rinse, repeat. I believe that a Mathematician should do Math every day, just as a musician should play music every day, and a writer should write every day. Oh, sure, there are vacations. But for every day you skip, it may take more than one day to “get your chops back.” How many hours per day is related to (4) and (5), at least. Technically, there’s a (7): if you have done work of any consequence, then someday a student of yours, or a collaborator, or a reader of what you published or spoke about at a conference, will take it to the next step, maybe or maybe not the step that you would have found if you’d only had more time. The above is merely my opinion. But it is close to what I tell my students. Do you think it is good to study and do mathematics all the time? What do you like to do besides mathematics especially when you are a student, if you wish to answer, or may be you are never tired? Thanks. Google reports 10 sites with this wording. My existing rule of thumb is that >10 sites constitute “Common knowledge” and therefore does not require a statement of source. Should I change my rule of thumb to >=10 sites? I am a frequent reader of your posts. I can’t express how helpful it is for a (at times) confused and frustrated PhD student to read posts like the one above. It not only gives useful tips on how to do research but also demythologizes it and gives relief by making one’s own struggle with mathematical matter a part of common experience shared even by mathematicians of such a magnitude as yourself. As a first year graduate student, I am finding it difficult to pick a subject to focus on in my graduate study. I find myself being drawn to so many different (and unrelated?) subjects, ranging from Probability to Algebraic Topology. How can one be sure that a certain subject is a better fit for them compared to another. I was hoping you could shed some light on your thought process when you chose to focus on Harmonic Analysis in your graduate study. Thank you so much! How much is Computer Knowledge essential for mordern mathematics research? Prof.Taos comments on hard work is truly good.I was told by my batchmates that I would not be able to reach the heights of some and that they do not do very much mathematics to to attain such high levels.But I have seen through my little efforts that it is the hard effort that actually pays off.While some of those so called naturally gifted ones have faded off. Hi Tao, can you provide rss feed for some individual tags. I am not a mathematician (which means not very much interested in your mathematical post). But I’d like to read some of your topics, like “career-advice”. which are also very fruitful to general research areas. Thanks! Your pages in real analysis is really good. Is this advice “don’t obsess on a single “big problem” or “big theory”.] is really good? I mean if you weren’t obsessed with Green-Tao theorem then do you think, you could have proved it afterwards. Also, if Prof. Wiles wasn’t obsessed with FLT, probably we couldn’t have seen a proof of FLT. “Obsession” only arises when one is not enjoying his work. If one is enjoying his work then i see no point in getting obsessed. I hope you don’t take this in the wrong way. Have you never thought about a single problem for a long time? If you didn’t then you wouldn’t be rated as the best. (and note in particular the crucial adverb “prematurely”). Regarding what is now known as the Green-Tao theorem, Ben and I in fact were not directly working on this problem to begin with, but on a much more modest problem (namely, trying to improve the best known bounds for Szemeredi’s theorem for arithmetic progressions of length four) when we stumbled upon a general strategy (namely, viewing sparse sets as dense subsets of pseudorandom sets, and then modeling the latter by dense sets of the entire integers) which Ben then realised had the potential to capture progressions in the primes. It was only then that we devoted our full efforts to this problem (which, after about six months, we eventually were able to solve). But until we had that observation, devoting significant amounts of time to the problem would indeed have been premature. It’s always a pleasure having reply. Next your reply was very much interesting. By the way you say, it took about six months for you to solve, i would like to ask an another question. How did you know that you were making progress on the problem? Was it daily, that you made a sufficient amount of progess. Lucy Kellaway of the Financial Times (and Business Daily on the BBC World Service) makes a related point: http://bit.ly/aKdOdS . Sorry if this is an inappropriate question, I am an undergrad student that have recently found a great interest in mathematics. I am soon about to write my bachelor thesis, which I am both looking forward to and not. The reason why I am not looking forward to it is that, when skimming through old students bachelor thesis’s, I realize that most of the students have reproduced an old result, or done a literature review, or equivalent. This is not strange to me, in the sense that most of the “cutting edge” research in mathematics have a quite high barrier of entry. But, I do think, and I do hope, that are many interesting problems out there to answer, that are accessible even for undergrads . The problem for me is that my experience in mathematics is small, and hence some problems which I think are interesting, more often than not have already been solved. To make my experience writing the bachelor thesis, as pleasant as possible, I humbly wonder If you have some general advice on this? Here, the key is “Of course, to work hard, it really helps if you enjoy your work.”, I believe. The journey to become a mathematician is long and difficult. I have an idea and I would like share it here. I think if you keep a special section in your blog which collects the potential research problems for young researchers, it would be great. You could use the International Congress of Mathematician field list such as algebra, analysis, probability, topology, ….then senior professional mathematicians post some research problems which could be a dissertation problem or research paper. They could comment on the problem difficulty level or point out the relevant literature. Young early career mathematicians pick up some of them and start working on it, ask their questions or share their ideas with other people, collaborate and finally write a paper. It would be great for the young mathematicians. I have to admit, you are definitely a huge inspiration for basically every Mathematics enthusiast(undergrad, high school, grad…etc). Usually people tend to believe that people who found theories just happened to be in that way and did it without any form of struggle. Basically it just came to them which ended up in one of those “Aha moments”. Well, it does have some truth perhaps, but without working for it, it is highly doubtful that it is possible. I find your posts very insightful. I majored in applied mathematics with a concentration in computer science. I am not “gifted” in math but I love math! I love teaching mathematics and guiding students as they reach their “aha” moment where they see the simplicity and beauty of mathematical problems. I have a MA in Interdisciplinary Education and would like to pursue a masters in applied mathematics, eventual a pdh in mathematics education. I believe that educators need to have content and pedagogical knowledge to be able to make learning meaningful. I’ll be taking open university courses this summer as I prepare to apply for graduate school. What advice do you have for future graduate students that aren’t “gifted” or are able to solve problems quickly? I worked very hard to earn my BS and my love and passion for mathematics are what allowed me to stay focused and on path. I’m an economics-maths undergrad at uni melb. I enjoy learning. But don’t care about grades. But i know they are important if I want to study further- however this seems to not be sufficient reason for me. How do I become ‘grade-motivated’ while still keeping this enjoyment in learning? Am 17, And i still dont know how to prepare for life in university,Am studying mechanical engineering,I want to have an above average understanding of mathematics&physics,…Any good advice will suffice. I think both things go together – if you genuinely enjoy learning, you’ll want to excel in using the skills that you’ve learnt, i.e. problem solving…so when you do your problem or homework sheets, you’ll enjoy the process of answering the problems, and you’ll naturally enjoy practising. This should ultimately translate to good grades! So keep enjoying the subject! dear prof tao how can you became so smart? I am a computer programmer and have some research experience in practical computer science, with almost zero knowledge base in advanced mathematics (ie, beyond high school). I am trying to explore more on mathematics research, and have come to know that mathematicians are in search of some kind of truth (is it true?) Although till high school, I was good at it, but my current understanding of mathematics research suggests that merely being able to do small manipulations and memorizations (as you’ve mentioned in one of your articles) doesn’t mean that I’ll necessarily be good at mathematics research. As it’s all about proofs, and I have had minimal exposure to such mathematics, currently I am finding it extremely difficult to keep up with the material I am trying to learn (Abstract Algebra, Computational Complexity Theory). Also, I am 23 now and am just above average intelligence. Do you think starting at this age I can (given that I want to) learn (and ultimately “contribute to”) pure mathematics? Just want to let you know that I’m a big fan. Cheers! “Once you have experienced it, you are eager to repeat it but unable to do it at will, unless perhaps by dogged work.” That was me after I discovered an easy way to mitigate my autism symptoms. I am a 15 year old from India, currently in the 10th grade. I want to participate in the IMO. From now, I have about 5 months to prepare. The question is, is that possible? Can I really prepare myself from the beginner level to the level of the IMO in 5 months? How did you go about it? Re “[you should] written down at least a sketch of how that piece of mathematics goes, and then ultimately writing up a complete and detailed treatment of the topic,” are these writeups supposed to be from memory? Perhaps if a person is a walking golden age it is a literal genius, then they might desire the secrets of the walking golden age. Perpetual Motion: Maybe if it’s not an idea I couldn’t be smart about it, as far as that goes it is a material idea with more meaning than most give me credit for.